against the Sumrall Bobcats on Friday night. Favre’s second play call from scrimmage was a reverse pass play from Cameron Myers to Jordan Duncan for a 41 yard touchdown. Sumrall answered back quickly, with one touchdown of their own, but missed the extra point, making the score 7-6 at the end of the first quarter. From there the route was on. Oak Grove scored 34 unanswered points in the second quarter making it 41-6 at halftime. After the half not much changed as Oak Grove poured on 23 additional points, using mostly second and third string units for a final score of 64-6. 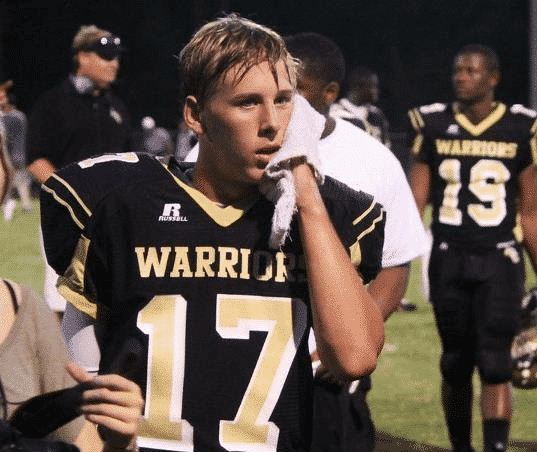 Oak Grove junior quarterback, Kirk McCarty, proved to be ready for the season opener as he accounted for four touchdowns, with three on the ground and one in the air. In a post game interview McCarty credited his offensive line saying, “They played a heck of a game." There was a lot of excitement on and off the field in Brett Favre’s debut. 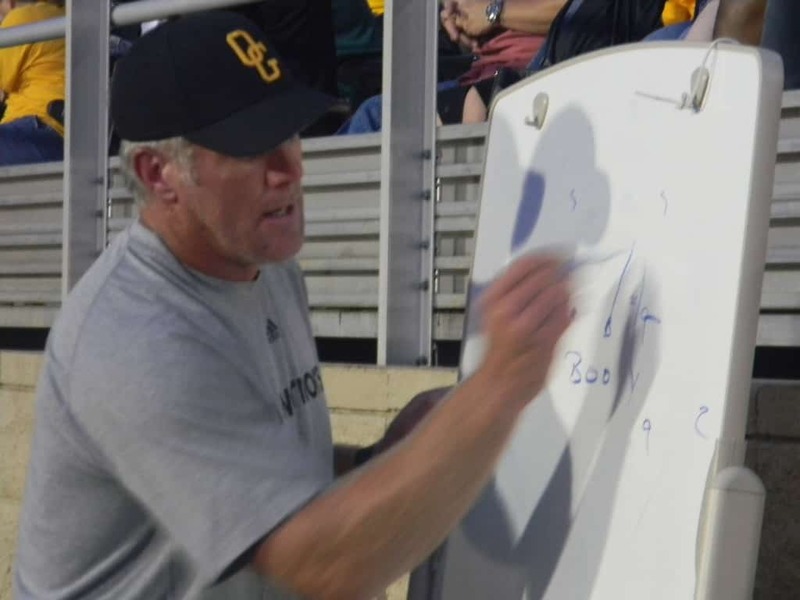 While the defense was on the field, he was coaching the offense via the drawing board and positive verbal motivation. It is clear that the young men at Oak Grove look up to the three time NFL MVP and Superbowl Champion. It is also clear that he fits right in as just another coach. There was nothing over the top and no big parade to reign him in as the new offensive coordinator for the Warriors. He proved that he is not a distraction to the players, and that he has the potential to become a great football coach as his offense racked up six touchdowns. In a post game interview request, Favre respectfully declined and instead requested that his players be the ones interviewed. Favre has been a winner throughout his career, and there is no doubt that he is one of the best minds in football. The sky is the limit for this new coaching prodigy. *We have plenty of video to be posted later today. Like this post or enter your email to the top right to be alerted when it is posted. Passing # 17 Kirk McCarty 12/17 124 yards 1 TD and no interceptions. Passing #6 Cameron Myers 1-1 41 yards 1 TD and no interceptions . Rushing #17 Kirk McCarty 6att. 74 yards and 3TDS. Rushing #23 Ty Harris 4att 86 yards and 1TD. Rushing #1 Jay Jordon 7att and 60 yards. Rushing #6 Cameron Myers 1att 57yards. Rushing #3 Schyller Dieuveille 2att 15yards. Rushing #9 Johnathan McNair 3att 13yards. Receiving #10 Jordan Duncan 2 receptions for 46 yards and 1 touchdown. Receiving #9 Jonathon McNair 3 receptions for 32 yards. Receiving #19 Jordan Mitchell 1 reception for 6 yards. Receiving #81 Logan Scott 2 receptions for 33 yards. Receiving #7 Picasso Nelson, Jr. 1 reception for 11 yards. Receiving #5 Floyd Terry 1 reception for 28 yards. Receiving #85 Trey Sloan 2 receptions for 14 yards. Favre's coaching debut and my writing debut! You have a 6A school playing a 3A school.. Come on that's not something to brag about! This is true, but it isn't every day a Superbowl MVP has a high school coaching debut.